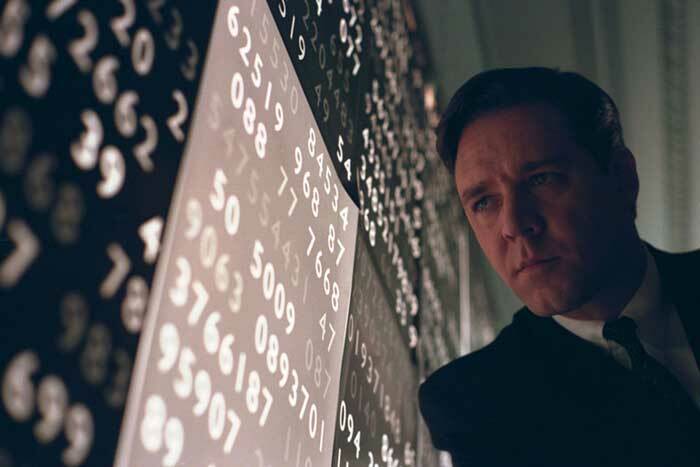 A celebration of both the mind and the heart, A Beautiful Mind is based on the true story of Nobel Prize winning mathematician John Nash. It is a towering achievement that affirms the amazing power of shining intellect when supported by brilliant love. Nash (Russell Crowe) arrives at Princeton University just after the end of the Second World War as a graduate student in mathematics, already recognized for his prodigious talent and social ineptness. He ignores his classes and all traditional learning methods to focus on finding a new breakthrough theory that would catapult him to prominence. His best friend is his room-mate Charles Herman (Paul Bettany), a free spirit more interested in beer and pizza than learning. Nash appears to be on the road to nowhere at Princeton until he finally develops the theory of governing dynamics, a significant enhancement to mathematical economics. He indeed emerges as the best in his class, and gets his pick of distinguished careers. Nash gets established as a senior mathematics professor working out of a military-associated lab at MIT. Alicia (Jennifer Connelly), one of his students, takes all the initiative to break through Nash's social incompetence, and they eventually get married. As part of his work Nash is occasionally called to the Pentagon to help break codes related to national security. He meets William Parcher (Ed Harris), a tough, no-nonsense government agent, who becomes a dominant presence. Nash is soon consumed by complex code-breaking work assigned by Parcher, and is drawn into what appears to be a dangerous international conspiracy, with Russian agents after him. He shuts out Alicia and his behaviour goes from eccentric to dangerously erratic. However, Nash is suffering an illness and will need radical medical intervention under the supervision of psychiatrist Dr. Rosen (Christopher Plummer). Over many years of struggle with the disease, Alicia's love, selfless dedication, and bravery are central to Nash's survival, and his road to any potential rehabilitation will be long and unsteady. 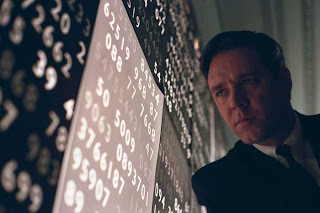 A Beautiful Mind is majestically constructed by director Ron Howard and his stellar cast. Howard manages to penetrate into Nash's mind, taking the audience on a wonderful journey that reveals the thin line between genius and madness. Russell Crowe gives one of the all-time greatest acting performances in the history of the movies. He embodies Nash from the young adult at Princeton to the distinguished but wounded scholar receiving the Nobel Prize, and despite plenty of temptations, never succumbs to over-the-top histrionics that could so easily accompany a role centred on mental illness. Jennifer Connelly delivers the role of her career as Alicia. The second half of the movie belongs to her, as she transitions from an almost incidental part of Nash's life to become the only person that can rescue him. Connelly needs to convince us - and Nash - that her love is at least as important as his intellect, and she succeeds magnificently. Thanks to Connelly, A Beautiful Mind becomes a stunning example of the true meaning of marriage. A supporting cast deep in talent provides a rich texture to the film. Ed Harris gives the tough-as-nails Parcher a real menace, a counterpoint to Paul Bettany's always available sympathetic ear. Christopher Plummer and Judd Hirsch ensure that even relatively minor roles are memorably delivered. A Beautiful Mind is a rare achievement, an emotional tour de force that finds its impact by remaining under-stated, controlled, and in touch with the true inner humanity of its characters.